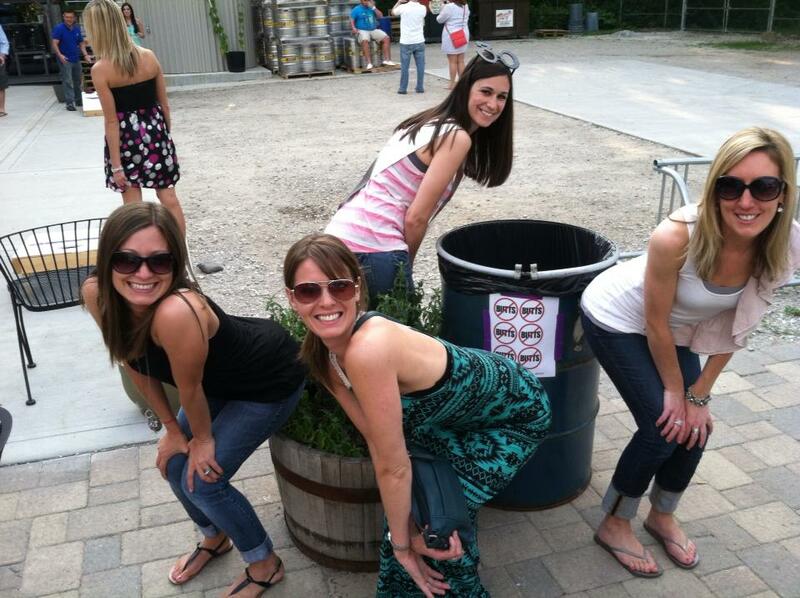 A 30th Birthday Celebration calls for good friends, good beer and a Brewery Tour of Indianapolis! To celebrate my friend Heather's 30th Birthday, we booked a brewery tour through Brewery Tours of Indianapolis. 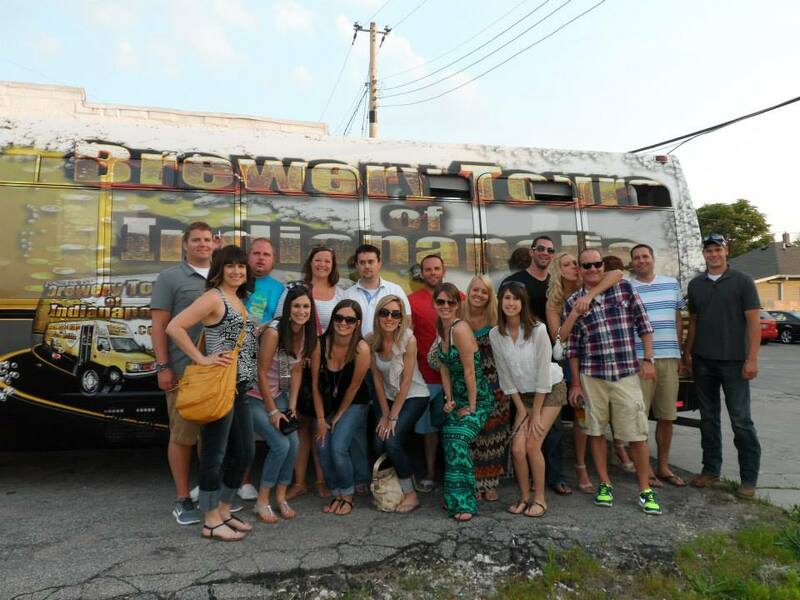 The tour bus, which holds 20 people, picked up our group at Thr3e Wise Men Brewing Company in Broad Ripple and drove us to 4 Indianapolis breweries - BIER Brewery, Black Acre Brewing Co., Flat 12 Bierworks and Fountain Square Brewing Co. - over a 3.5 hour period. 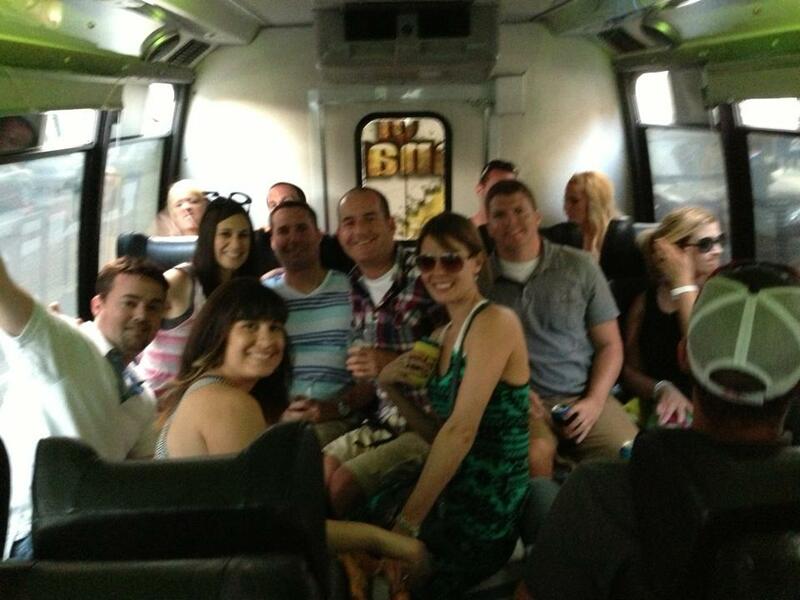 The cost was $30 per person for the transportation, unlimited bottled water on the bus, complimentary cooler space for chilling growlers and a goodie bag which included a glass, koozie, coaster and sticker. Even though our bus was a bit late picking us up, the tour proved to be a great way to celebrate a birthday. We decorated the bus, brought on food and drinks and were all able to enjoy ourselves without the worry of a DD. The tour set-up everything with each location we visited - all we had to do was show up ready to party! Our first stop was BIER - this small brewery has been in business for 2.5 years. They sell their beer in many local restaurants and bars but do not package for sale in liquors stores. We were greeted at the door when we arrived at the brewery and were instructed to have a seat while they explained a bit about the brewery and described the 4 beers that we sampled. The public can go to the brewery and purchase growlers and starting mid-June, they will be opened on Saturday nights as a bar selling pints. The staff did a great job detailing the flavors of the beers, making small talk with us and promoting their business, which unfortunately none of us had heard of. The beer was good, but the staff really sold us on this brewery - it was a great place to start our tour! 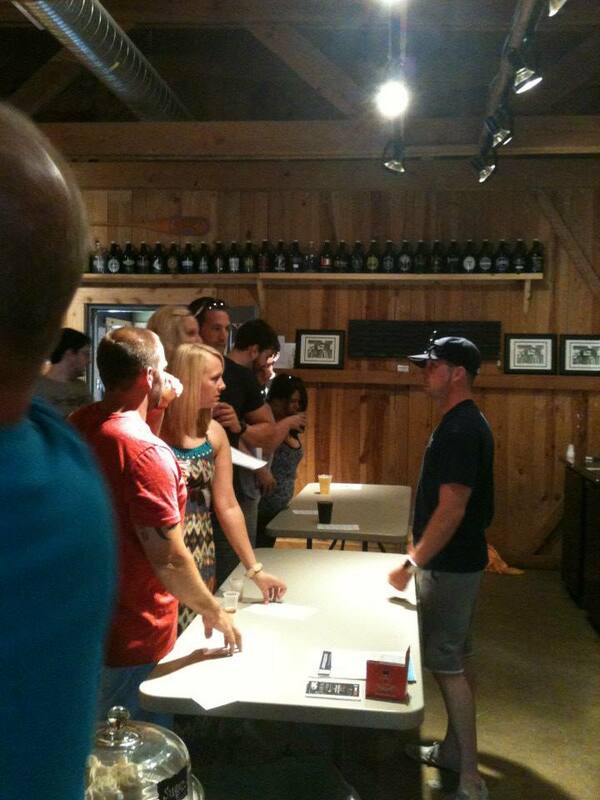 Our second stop was Black Acres taproom in Irvington. The brewery is a small 3 barrel (93 gallon) electric brewing system. They focus on brewing specialty and seasonal ales, with a few being offered regularly. This location had a more refined feel, a trendy yet homey atmosphere. As opposed to the previous location, this bar offered flights for purchase as a way to sample their beers. A few of us split a flight of 8 of their beers. I discovered a really liked some of their darker beers that had a hint of a coffee flavor. My favorite was Architect’s Breakfast (Rye Whiskey Barrel Aged Coffee Stout), an American style stout infused with coffee beans from Daterra Farms and roasted by BJava, aged in rye whiskey barrels for over 4 months. The staff was nice, and they offered a large variety of beer - there was definitely something for everyone at this stop. Stop 3 was Flat 12. This was the most well-known brewery that we visited. The brewery consists of a 20 barrel DME brewhouse and a floor of fermenters and brites, accompanied by two 120 barrel fermenters outside the building. They offer five house beers, four seasonals and some ‘select’ beers for special promotions and/or monthly exclusives. Their beer is sold in many liquor stores and bars. The location we visited had a simple set-up - a small bar with taps and a really nice outdoor patio area with lots of seating and corn hole. Being our third stop, it was nice to grab a beer and sit outside and enjoy it! Again, you had to purchase your own drinks here, but they did give samples to help you make your choice. I had the Walkabout Pale Ale - it wasn't my favorite drink of the night, but it was worth trying! The final stop was Fountain Square Brewery, opened in the summer of 2011. A great last stop due to the relaxed atmosphere which included hula hoops and couches for lounging. We had a great time playing with the hula hoops and chatting about the day's events. The brewery had a large taproom with a glass wall looking toward the brewing area. I sampled the Preacher's Daughter Amber Ale and the Hop for Teacher Pale Ale. They were pretty tasty! The bus dropped us back off in Broad Ripple after our tour was over. I am glad we implemented this idea for celebrating Heather's b-day. This adventure was definitely a one-of-a-kind experience, a bit out of the norm and a perfect way to celebrate any occasion! You can also sign up for a tour individually or in small groups, you just simply reserve tickets online. I believe it was worth the money and more importantly an excellent way to explore the ever expanding micro brewery market in Indianapolis. I am glad we were able to pull off this amazing night for an amazing friend's milestone birthday - she deserves it!